Over 4,000 runners set off at the start of the Great Eastern Run. Photo: David Lowndes. A record entry of 4,160 runners took part in the 2016 Great Eastern Run. Here are the top 100 finishers in the men’s race, the top 10 finishers in the women’s race and all the wheelchair race finishing times. 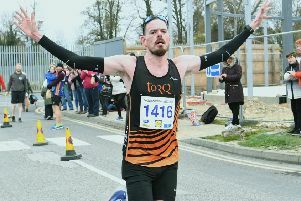 More results amd photographs in Thursday’s (October 13) Peterborough Telegraph. 100 Chris Neil (Barrow Runners) 81.10. 2 Gary Donald (Victoria Park) 1.25.33. 5 Phil Curry (unattached) 2.45.28.